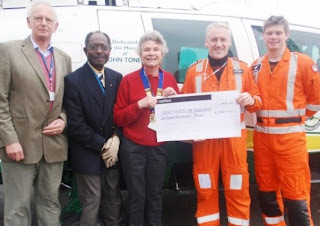 A PRIDE of Ponteland Lions visited the Great North Air Ambulance to give it a funding boost. Joint President Muriel Sobo, Secretary John Morris and fellow member Yomi travelled to Durham Tees Valley Airport, where one of the service's two helicopters is based, to present a cheque for £2,500. The Air Ambulance covers an area from the Borders to Yorkshire and from coast to coast. Staff take about 1,400 calls a year. Ponteland Lions members were hugely impressed by the set up, which includes computers linked to up-to-the minute details of the land-based ambulance service and medical personnel and a pilot all kitted up, ready to go at a moment's notice. Funds were raised by the Lions Club through its annual Swimarathon event, where sponsored teams from the schools and clubs of Ponteland swam lengths of the Leisure Centre pool — the main contributions came from Ponteland Middle School and Ponteland Swimming Club.